A new research study has indicated that Android tablets have made a strong impact among adult tablet owners in the US. If you happen to own an Android tablet, what will you do on your pad? Watch movie and video or follow the news? Still don't have any idea? Below is a survey about what users are willing to do on a tab. According to the Online Publishers Association, video comes out on top as the most-common type of content viewed on tablets. 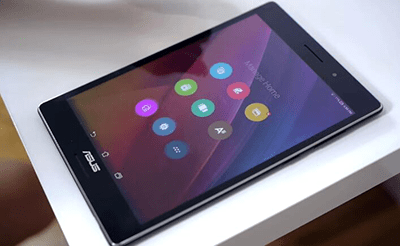 Owning to stunning display, many users opt for watching movies and videos on Android pad. However, all tablets do not have the DVD drive for playing DVD movies. That means if you want to watch new DVD movies on your Android tablet, things will not go as you want. Any possible solution to import DVD movies to Android tablet? The answer is absolutely YES! All you need is a DVD ripper to rip DVD to Android tablet recognized video format. MacX DVD Ripper Pro is one of best ripping programs to help you easily copy DVD to Android tablet, ranging from critically acclaimed Sony Xperia Z4 and highly reputed Samsung Galaxy Tab S2 to innovative Google Nexus 9 . Convert homemade & encrypted DVDsto Android tablets (Sony Xperia Z4, Galaxy Tab S2, Galaxy View, Nexus 7 2016 etc.) with 36X faster speed and zero quality loss. 1. Protect your precious DVD collections against scratch, covered with jam, or even damage due to year-after-year in and out DVD drive once copying DVDs on your Mac. 2. To bring DVDs with you means heavier packages will be carried. This software helps you rip DVD disc to Android – letting you play DVD on Android-powered tablet in a much more convenient way without taking along DVDs even if you are on a long vacation. 3. DVDs nowadays usually come with copy protections, ranging from CSS protection, Sony ARccOS protection, Disney new copy protection, etc, but this DVD ripper for Mac makes DVD to Android tablet conversion hassle-free, regardless of encryption put in place on DVDs. 4. Quality isn't an issue with this program, not to mention its copy feature, making converted video the same as original. 5. For us non-pros, this Mac DVD ripper for Android tablet is very simple to get it right the first time. Thanks to the wizard-style interface, you can convert movie from DVD to Android tablet on Mac like a breeze. Below are the detailed steps for Mac users to convert DVD to Android devices, be it Samsung Galaxy tab S2, HTC Flyer, Google Nexus 9 or Xperia Z4 . How to Convert DVD to HTC Flyer Tablet on Mac? What shall be particularly mentioned is that this DVD ripper has two versions for you. For Mac users, you can simply download Mac version DVD converter(macOS Mojave incl. ); For PC users, you can choose the Android DVD ripper for Windows (Win 10 incl.) to rip DVD to Android tablet on PC. Download and run this DVD ripper on Mac, click "DVD Disc" button to import the DVD you want to rip. Alternatively, you can hit "DVD Path" button to import your files. Since you want to rip and convert DVD to Android gadgets, you can go to "Output Profile" drop-down menu to pick up general pad video accepted format, say MPEG4 or H.264 as the output format for playback on your Android tab. 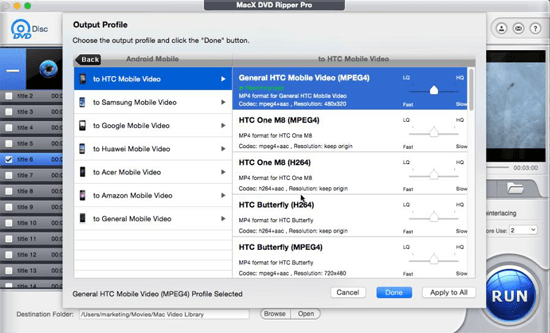 Alternatively, MacX DVD Ripper Pro offers specific output profiles for your devices. For example, if you want to convert DVD to Amazon Kindle Fire HD, you can simply choose Kindle Fire HD 7 inch as your output format. For specific DVD to Kindle Fire HD tutorial, you can check here. Click the "RUN" button to convert new movie DVD releases to Android Tablet on Mac. You can view the whole progress and are able to cancel it at anytime. Note: This Mac DVD converter for android tablet serves as an excellent DVD to video converter to rip DVD to MOV, MP4, FLV, iTunes, etc for playback on iPhone (iPhone X/8/7/Plus included), iPad (iPad Pro included), iPod, Samsung, etc on the move. Furthermore, if you want to play the converted DVD content on iPhone iPad iPod, you can rely on iOS file manager - MacX MediaTrans to easily transfer video from computer to iDevices for playback on the move.